Opening for Kiss in Europe, catching the attention of Kiss manager Doc McGhee, opening for Ted Nugent and having their lives chronicled on the MTV special Rock 'N Roll Dream - all before releasing their first album? Compounded by the fact that the members of Crooked X are between 14 and 15 years old and are just finishing up their first year of high school and you get the picture that something really big might be happening here. Playing together since the 5th grade, Forrest French, Jesse Cooper, Josh McDowell and Boomer Simpson actually wrote some of the songs on this debut album when they were only 11 years old! Produced by Spencer Proffer (Quiet Riot, W.A.S.P.) and mixed by veteran Michael Wagener (Ozzy, Skid Row, Poison), Crooked X's debut album is a surprisingly slick and very good mix of modern hard rock/metal that leans heavily on the Godsmack, Black Label Society heavy groove metal style with touches of 80's era Skid Row, AC/DC and even classic Metallica and Led Zeppelin. With a sound that is heavily based on the ultra-hip drop D guitar tuning that is pretty much a staple of the latest wave of radio-friendly hard rock bands, Crooked X also manages to deliver a very tasty and catchy mix of songs here with their debut. The album opener Gone is classic modern hard rock with chunky guitars, catchy vocal melodies and a great chorus. The stuttering Zeppelin style riffs and classic 70's hard rock vocals by Forrest French had me taking a second look at the picture of the band on the back cover of the CD. There's absolutely nothing here to suggest that this is in fact a band of kids. They have a very diverse and strong set of songs with enough maturity in their playing style and song writing that goes far beyond their years. More angrier edged tracks like Adrenaline, Lost Control and Nightmare (featured on the Rock Band game) sees the band's love for heavier bands like Godsmack, Down and Black Label Society showing through in their songs. Slower and plodding heaviness premeates Time Is Now and Nail In The Coffin, with sludgy riffs and some very solid lead work by Jesse Cooper. Classic 80's hard rock/metal is front and center with the AC/DC inspired Rock 'N Roll Dream which also sees some Skid Row influences with a track built around a fairly simple guitar riff as well as the glam metal flavored You Gotta Bleed. For a debut album from band whose members are no older than 15 years old, I must say that I'm very impressed. This may not be in line with everyone's tastes in hard rock/metal but this is a far superior brand of modern hard rock than what's polluting the FM airwaves these days. 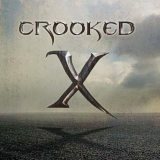 Crooked X has a diverse yet charismatic feel with a very solid and heavy guitar based sound. Forrest French's voice sounds amazingly strong and mature for his age and track after track, this band's talent for writing great hook-laden songs is very evident. They never really repeat themselves and show lots of influences with their music. With many fruitful years ahead of them, they seem to have everything in place to really make a run for it. A word of warning for Nickelback and all the other Nickelback clones out there....there's a target on your back with a Crooked X on it right now.